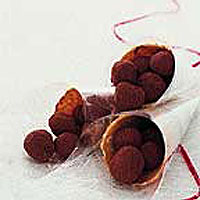 For a real indulgence, try these rich truffles, which need only a few ingredients and are very simple to make. The only problem is having to give them away - so make plenty. For a pretty gift idea, pack them in ice cream cornets, wrapped in Cellophane and coloured paper. Tightly cover a large, heavy chopping board or a baking tray with clingfilm or baking parchment to place the truffles on to set. Place the chocolate in a large mixing bowl, at least 1.75 litres in capacity. In a small pan, bring the cream to a rolling boil and immediately pour onto the broken chocolate. Blend thoroughly with a wooden spoon until smooth and all the chocolate has melted. When the ganache has set, use a teaspoon to scoop out bite-sized pieces. Dust your hands lightly with cocoa powder or icing sugar to prevent them sticking and roll the pieces into balls in the palms of your hands. Immediately roll the truffles in sifted cocoa powder, icing sugar or finely chopped nuts, then place on the board or tray and chill in the fridge until set. The truffles should be kept in an airtight container in the fridge. They will keep for up to 10 days. Dust with a little extra cocoa powder or icing sugar from a sieve or tea strainer before serving to freshen them up. For milk or white chocolate truffles, simply replace the plain chocolate with 300g Waitrose Organic Milk Chocolate or Waitrose Organic White Chocolate. For alcoholic truffles, add 75ml rum, brandy, Calvados or any other alcohol you like to the ganache before allowing to cool and set. Generally, the rougher the alcohol the better, as 'fine' alcohols tend to get lost in the depth of flavour of the chocolate. If you feel confident working with chocolate, you can very gently melt about 175g chocolate and dip the truffles in it before rolling in the cocoa powder or other coatings. This helps the coating stick and gives the truffles a contrasting 'crunch' as you bite into them. A chocolate coating will also help them to keep longer.